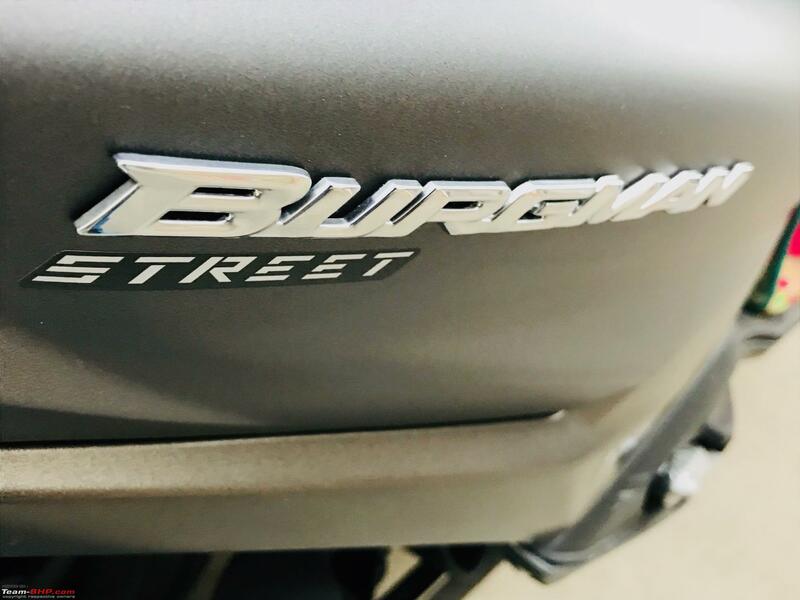 Suzuki Burgman 125 Ownership Review - Grey Gargantuan! I have always been fascinated more with bikes than cars. Its just the way I was built. As a child I rode on my mom’s back pretending she was a bike and not a horse as many kids do. I remember seeing a Moto GP back in 1992 (5 years old) and wondering how is that rider not falling at those turns. For me it was magic. I struggled to learn how to ride a bicycle over the course of an entire summer vacation. I was a very slow learner with an extremely persistent mother. Once I was able to balance the bicycle, a gorgeous red Avon BMX, I knew I would fall in love more each time I rode. Nearly 25 years later and my love grew like an ocean and also focused more so on naked bikes. I just loved the feeling of getting bashed by the elements. One thing which I never really felt attracted to was gearless scooters. They didn’t seem feminine or lacking in power, they just didn’t appeal to me at any level. When the Kinetic Blaze came out, I did for the first time take notice of it and that was something I would love to ride. I never got the chance and then it got phased out. I forgot about it and merrily moved on. 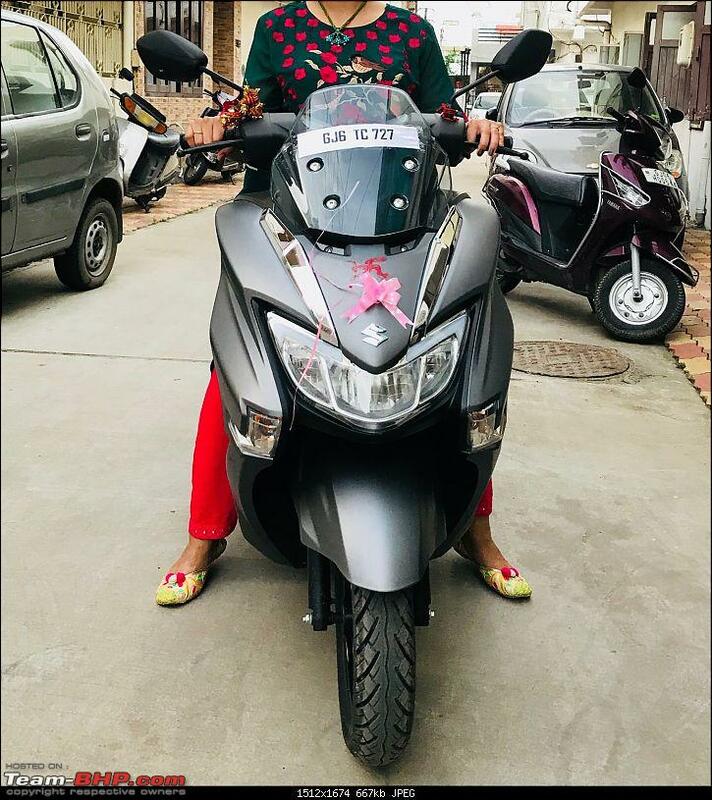 Of recent my wife was facing issues with her current 5 year old Activa and it was due for a replacement. I still knew nothing about scooters and it was not gonna change soon. Thankfully TeamBHP and XBHP had my bike and the ownership as well as official reviews helped out a lot. My wife on her part only demanded that the scooter should not look like a run of the mill scooter. This was to be a birthday surprise for her and so the stakes were higher! I initially zeroed in on the Ntorq. Test rode it and booked it within a day (14th August). All felt good and I have to admit I was swayed by the console as well as the fact that it was available in my wife’s favourite colour – blue. I was reading and watching online reviews every day after booking just to make sure that I indeed was buying something that would make my wife happy. I knew it already stood out with its fresh design but being a wary owner of an RE in the past, I am extra vigilant when it comes to reliability of a vehicle. A common thing in almost all YouTube as well as written reviews, which I noticed was how every reviewer kept bringing up the Burgman in the Ntorq review. It got a little irritating initially. Just google the Ntorq reviews and you will get comparison with Burgman in half of them. 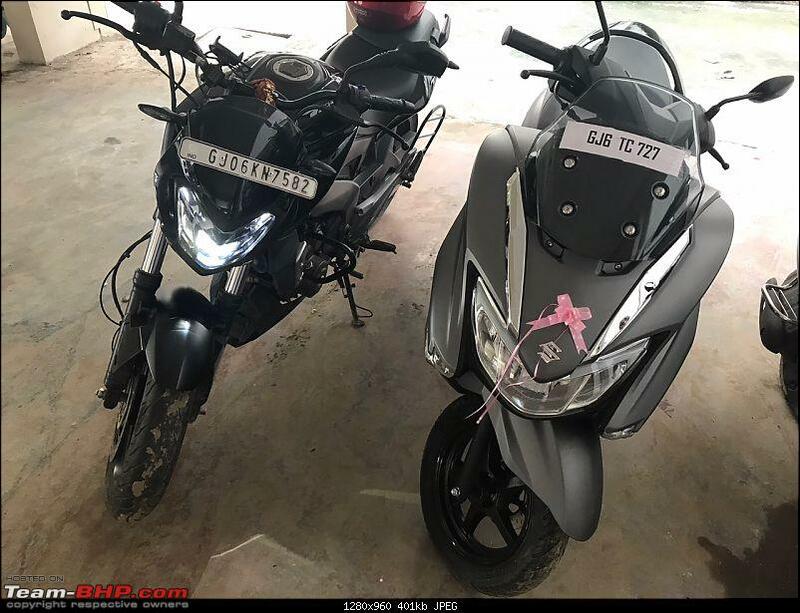 Then came the detailed ownership thread on XBHP where a couple of owners complained of the breakdown or starting issues of the Ntorq. An owner clearly advised me to steer clear of it if the intended rider was a female since the Ntorq requires some labour in the form of more than a few kick starts to get it going from a cold start. The balance slowly started shifting. Mind you, I had not yet seen the Burgman in the flesh and a friend who saw it and had the Access 125 himself, said it looked too weird. So on a Sunday (26th August) another friend and I decided to at least see the Burgman in the flesh. Please note that my original budget was somewhere in the Jupiter range i.e. Rs 65000 on road! I was already stretched out with the Ntorq and I knew that the Burgman was no where in reach. My first impression when I saw it was simply “WOW”. It was big and it from up front it reminded me of a full blown sports touring bike. In person it looks much bigger and longer than the competition (if there is any!). The storage space and floor boards are big. My criterion was simple. I could easily fit my Studds full face helmet in the boot and shut it. I could not do it with the Activa and the Ntorq. I never use half face helmets nor does my wife and this was a big bonus. Regarding the floor board, that extended riding position was something I adored in the Burgman. While test riding I never once went to the default “feet at right angle” position even at crawling speeds. The balance was good and I was very comfortable. The engine had decent pep too. I cant comment much on this but I can tell you that I felt the Ntorq pulled a tad better than the Burgman. The Suzuki engine though, felt smoother. My friend who actually rides scooters a lot gave me a big thumbs up and a wide grin after he test rode it and it sealed the deal. I decided to increase my budget and get the Burgman. Booked it that day and I promised to transfer the balance payment within 2 days via NEFT. I did this since I wanted the scooter within a week and it was promised that the only way that would happen was an immediate payment. No issues, I would have done that anyway. I had to follow up twice with the sales guy to get the bank details of the showroom. I had asked this when I was booking the scooter and he simply said, I will send you the details on sms since he did not have it handy at that moment! The colour options as of now are very limited. The black one looks fabulous but my wife has already had 2 black Activas and I did not want to continue the tradition, so black was out. The White was not in the showroom and frankly I was not too keen to get it anyway. That left the Graphite Gray (matt colour) for consideration and honestly it looked very classy. If you think the black one looks beautiful you should see the Grey colour, it looks massive. I didn’t have a doubt in my mind that this was the colour. The sales person immediately told me that he would keep the grey one aside for me and delivered on that promise. However there were small irritating instances. After the payment I had to follow it up with the sales person 3 times to ask him If the amount had indeed been deposited in their account. I had received a notification from my bank that it had and it took them more than 4 hours to confirm this. Ok, I can let it slide. Then the weekend before I had to pick it up I wanted to confirm that the showroom was indeed open on 3rd September (Janmashtmi) and the sales person’s number was unavailable for 2 days! I had to call on the landline of the showroom and the guy who picked up had no idea if I had made full payment. He did confirm though that my delivery was scheduled for Monday thankfully. Warning bells sounded and I visited the showroom on a Saturday after that phone call and the manager was courteous enough to talk to me and tell me everything was in order and when I asked him like I had asked the sales guy if and when I have to submit my ID proof, he finally told me he needed it. In comparison, everything had been made clear about documentation and delivery timeline in the TVS showroom on my first approach. They were very thorough and active on whatsapp as well. Something that the Suzuki staff was not. The manager also told me to call him and remind him on Monday morning about my scooter’s delivery. Hmm ok! I did that and like the past 3 times I said I would be landing up at 12 noon to pick up the scooter and would appreciate it if everything was ready. We reached on the dot and apparently they had not even started getting the scooter ready. We were made to wait till 1:30 pm in the afternoon. I did a brief PDI (from what I know) and cranked up the scooter. Honestly I was a little pissed off at the shoddy treatment and left without even thanking the sales person. Although I did appreciate that none of them pushed me to make the booking and payment immediately which many sales people do, I did not like the fact that the staff did not explain or give demo of any of the features to me. I was not expecting special treatment but I do not know much about scooters and in comparison the TVS sales team was very comprehensive and enthusiastic while explaining the advantages of the Ntorq. 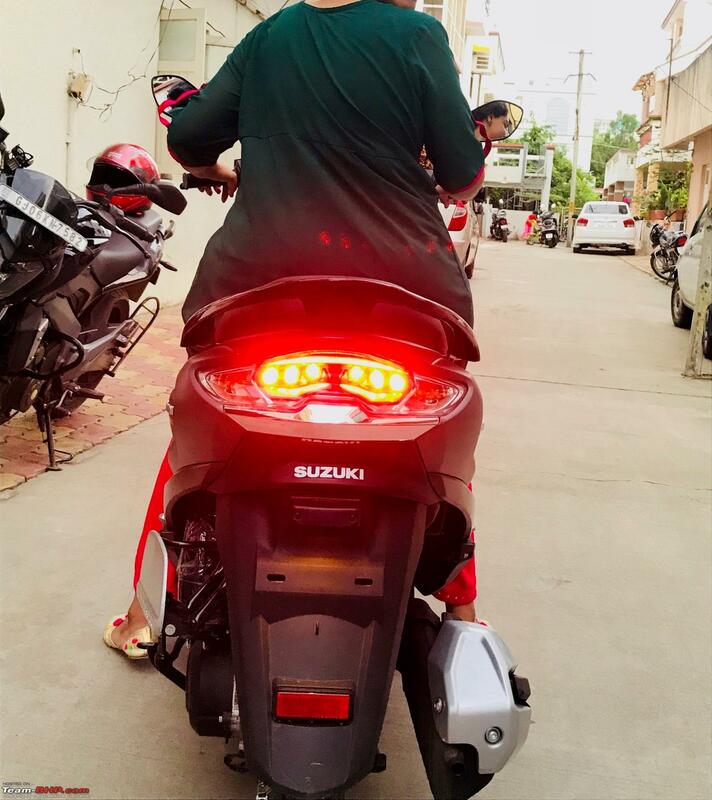 With Suzuki it never felt like I was buying their most premium scooter. This despite that I had told the sales person on the first meeting that I had booked the Ntorq and was considering changing my decision. He never seemed interested. Weird! Wow I wrote quite a bit on that didn’t I? If you are still with me let me get to the meat of the review. The, err, review! 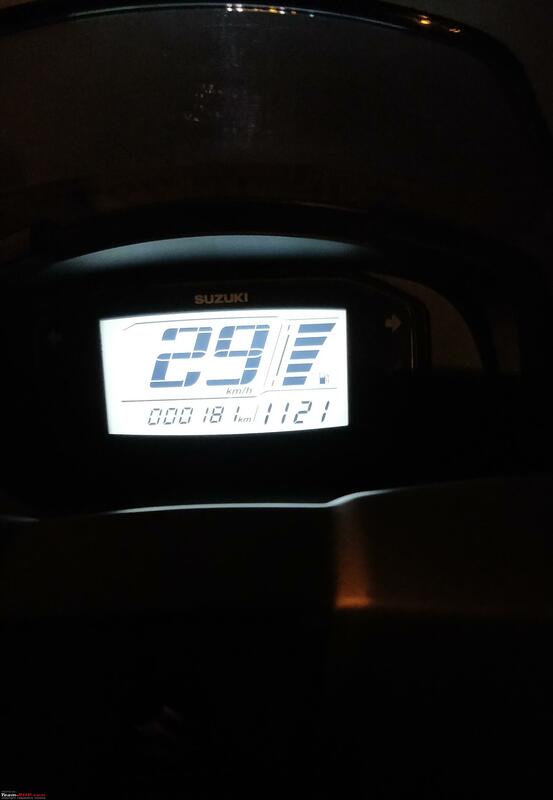 As of now we (my wife and I) have ridden just under 100 kms and the scooter has been with us a week only. I took delivery and tanked it all the way up so I could test the mileage and you all will have to wait a bit before I can answer that question. The following will probably change as time passes! Super light! This means a lot of fibre parts. We all know what that means. That small rear tyre. You probably noticed that too. No external fuel filling cap. 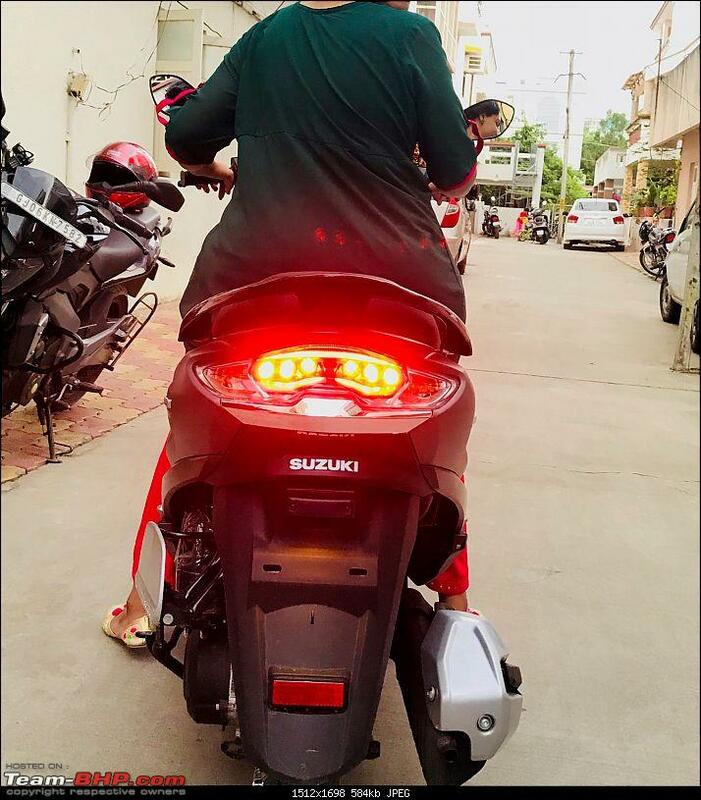 On a maxi scooter. In 2018. Front disc brake lacks feel and the lever needs to be pulled a lot more than you would expect before it starts working. The rear end doesn’t look as bold as the front end. Its pretty but not as butch as the front. Listing the Pros now so you don’t think I am a sadist! Street presence. Even ladies in cars turn around and check it out. Then they tell their husband to see it! 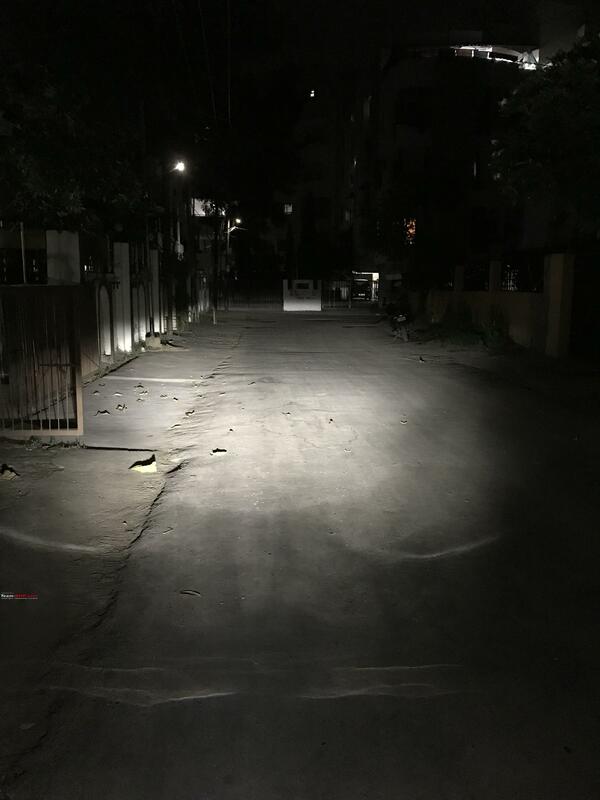 Gorgeous LED Headlight. 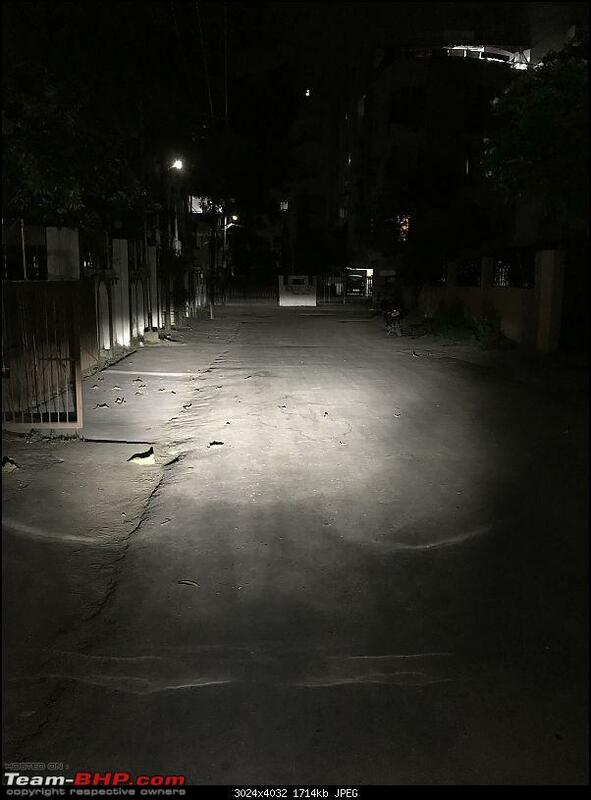 I have ridden it twice at night and it is decent at low beam. Not sure about the high beam yet. Very nicely integrated turn indicators. They aren’t LED but look very nice. Nicely integrated foot pegs (aluminium) as well. They feel sturdy too. Very big and functional looking console. It is positioned better than any bike I have ridden. It is totally in the line of sight and has massive fonts for speed and fuel. Clock is also large. Super chunky and plush seat. Maybe I am over selling it but gentlemen and ladies, I ride a bike! So yeah this level of comfort was unheard of for me. Perfect suspension set up. I don’t know how they have kept the scooter so nimble and given it such a ride quality. Nothing needs to be edited here. Combi brakes are fabulous. If you press the rear brakes only it also applies the front brakes. Trust me this is opposite for someone like me who relies only on the front brake of my bike. Weirdly the CBS does a better job at extracting braking power from the front wheel than using it yourself. Rear mirrors have a lot of room for adjustment. I am 6 ft tall and whether I sit in the relaxed stretched out position or the straight position I always find the perfect spot for them. Only about 10% is blocked by my forearms, which is very reasonable. This means when my wife rides, it is a whole lot better. Loads of space. For your foot, your bum and all those knick knacks. 2 very generous proportioned men can sit on the scooter and not have their umm “prosperity” hanging out from the bodywork of the scooter. Engine = smoothness personified + brisk acceleration when needed. As a male rider I love the extended floorboard and my body frame feels very relaxed. I am also able to do some hard braking since the sole of my feet take the weight of my body when I brake and stop me from sliding forward on the seat. The handle bar feels very very bike like. This is a good thing for me but my wife needed a couple of days to get used to this. Since the front of the body remains fixed, she kept getting the steering inputs wrong. But this happened only the first 2 days. She is happily taking it to work now. The console comes with 2 trip metres and you can change these by pressing 2 buttons on the console. These are soft rubber types and thankfully you don’t need to wrestle with them to get them to work. This is good news for those with delicate fingers. Ladies with long nails will also appreciate this. The pick up, if you are coming from a 100 cc scooter will take you by surprise. This is my wife’s and her friends’ inputs. You need to be gentle and get the feel of the sensitivity of the throttle. Ditto for the brakes. They bite well when used in tandem and the CBS really does do an above average job. 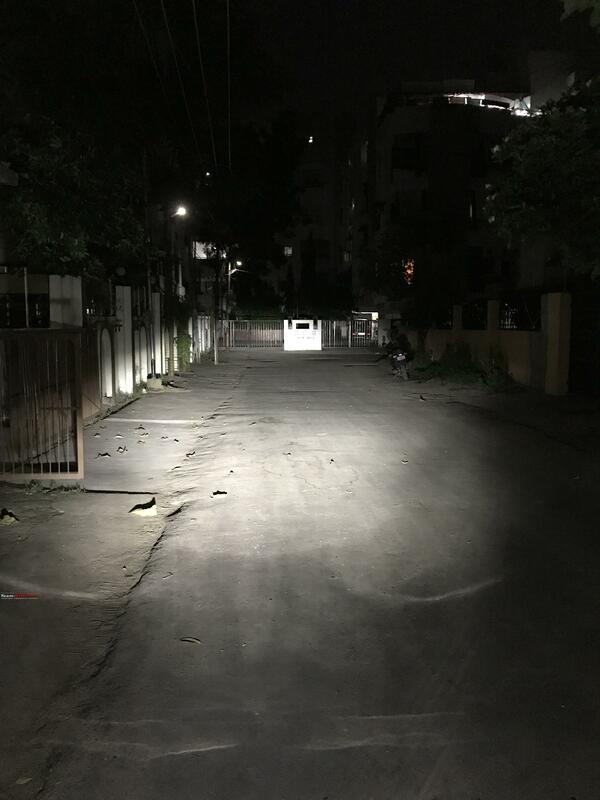 The headlight throw from what I could notice was about 20 – 25 feet up front and this was where it had the highest intensity at low beam. It fades quite a bit after that. This is a very rough estimate and am writing this purely from memory. One thing I do remember clearly is that it had a wide throw. The size is something I still cant get over and I took some pics of the Burgman parked along side my every day rider Dominar and this will give some perspective to it. 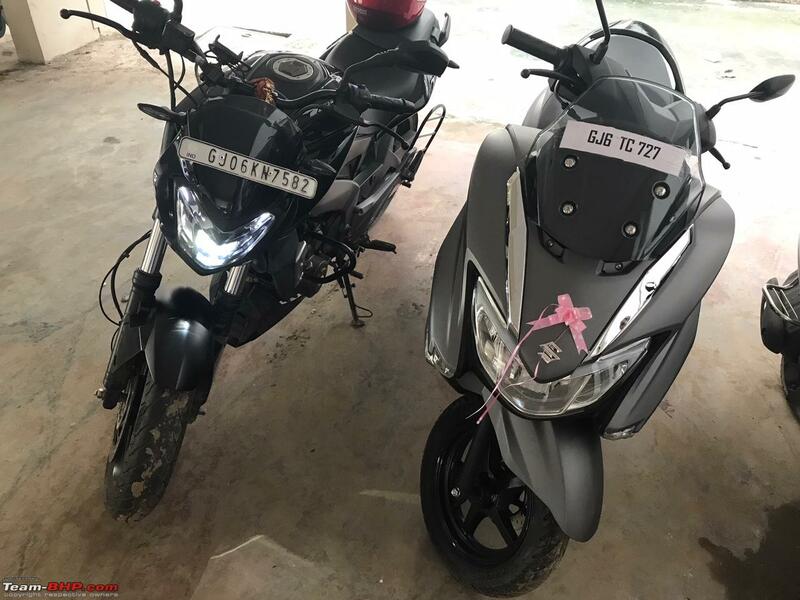 My one concern right now which I would like other riders and maybe owners to answer is regarding the front number plate fitting. There is decent space at the rear but I cannot understand where the front number plate will go. Any ideas? I asked the showroom guys and they were clueless but said they would figure it out. I think mine is one of the first few Burgmans they sold in the city. This is all I have for now. Please do ask anything you want and I will be happy to answer after asking my wife! No I am not hen pecked, its because she is the one riding it every day. Also this is my first ownership review and I sorry about the lack of pictures in the post. 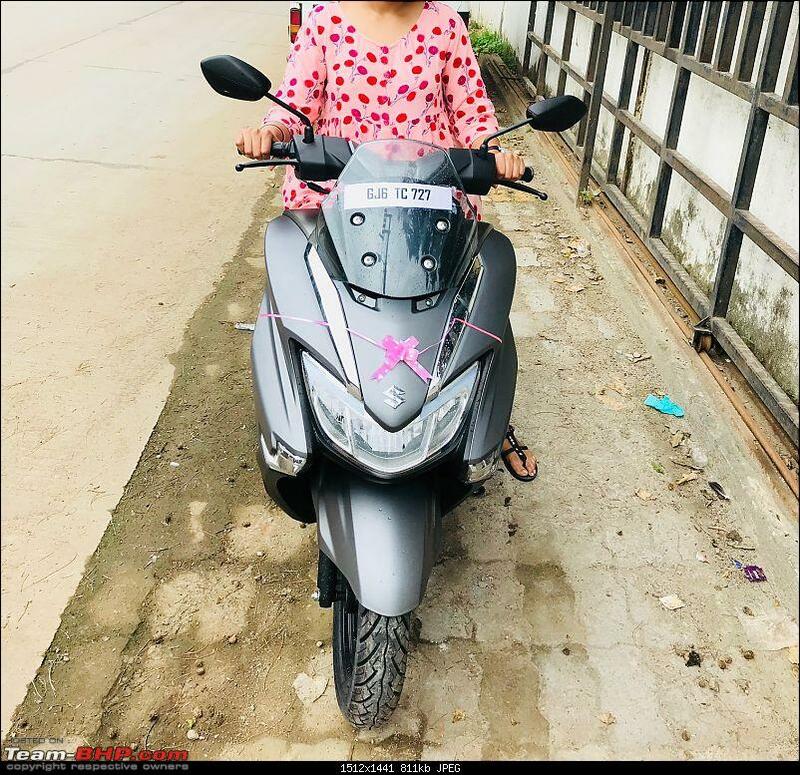 Re: Suzuki Burgman 125 Ownership Review - Grey Gargantuan! A hearty congratulation on the new Maxi!! It looks great in Grey. I initially zeroed in on the Ntorq. Test rode it and booked it within a day (14th August). The engine had decent pep too. I cant comment much on this but I can tell you that I felt the Ntorq pulled a tad better than the Burgman. The Suzuki engine though, felt smoother. How is the ride quality between these two? I understand that the Burgman is lighter and has marginally lesser power. Does the Burgman soak bumps as well as Ntorq? The Access 125 always had parking brake i.e. a small silver colored hook on left hand side. This may have been a casualty of CBS. The Burgman is less stiff as compared to the Ntorq. I rode both of these albeit 2 weeks apart on the same stretch of road since the showrooms are only 0.5 kms apart. Burgman felt more comfortable in soaking up the bumps. I pushed it on a rough patch where I had pushed the Ntorq and unlike the latter, I did not feel the need to back on the throttle. Power is clearly better in the Ntorq. Despite being heavier it moves faster and that feeling of getting your arms pulled is in the Ntorq. It sounds better too and hence the feeling is amplified. Congratulations on the new ride! Do you think the distance between the seat and the handle is more than that of an Activa? It might be just the illusion due to the design. Ever since I saw the advertisements for the Burgman, I had mixed feelings about it. While it looks good and stylish from some angles, it looks awkward from other. For example, when viewed from the side, it looks tad a bit awkward. Putting that piece of critic aside, your Burgman looks good in that color. Do you think the distance between the seat and the handle is more than that of an Activa? Thanks! I measured the distance from the edge of the seat to the centre of the handlebars for both the scooters and for the Burgman it is about half an inch more. My wife's words "the distance is as a matter of fact more but at my height which is 5 ft 5 inches, I do not feel it to be an issue. I do not have to lean forward to reach the bars." A word of caution from my wife who is a first time disc brake user. 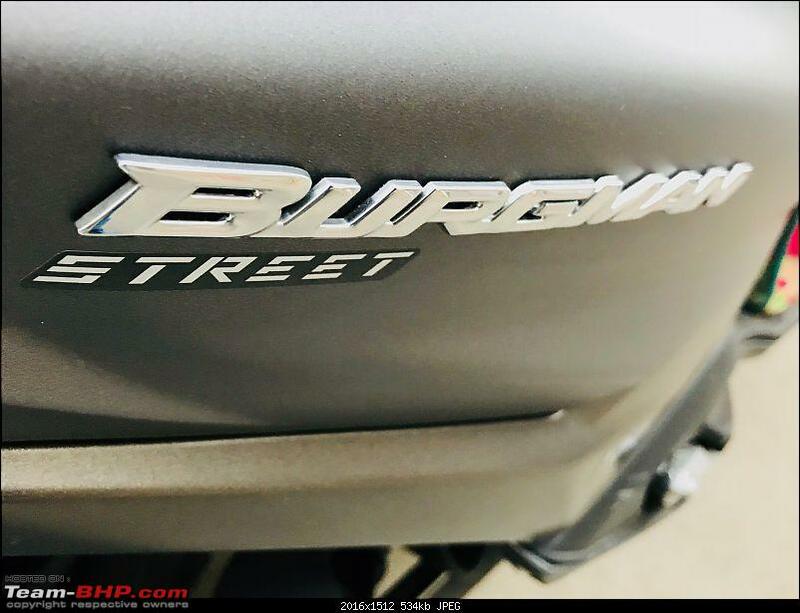 "The Burgman front brake has eye popping power and one needs to be very cautious not to over do the front brake. It should never be used in isolation and one must assist the front brakes with the rear ones." Like I mentioned in the review, up till an extent the front brakes seem ineffective and the best way is to use the rear brakes to activate the CBS. Last edited by navin : 10th September 2018 at 11:02. Hey Vikram, a really good job with the ownership review, covers almost everything in detail but I would like to know, didn't you consider any scooters from the Honda Stable, namely the Grazia? 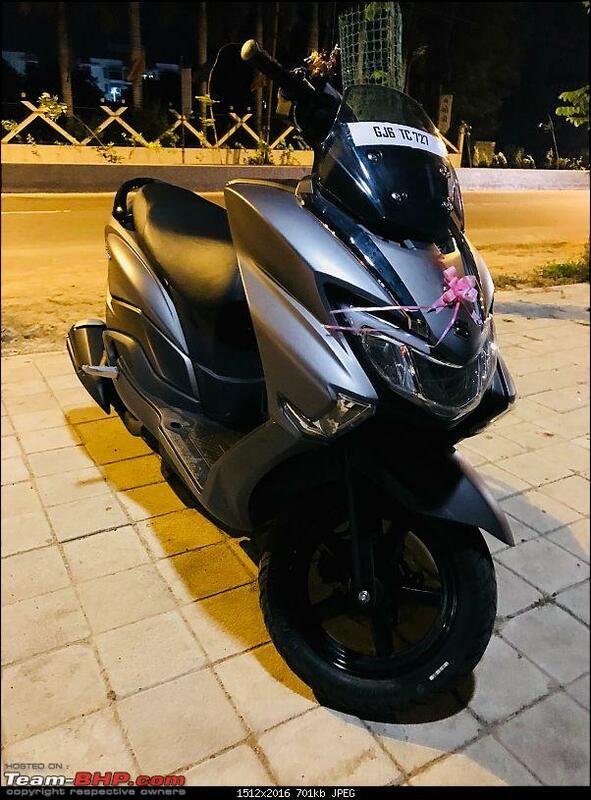 Seems to be a nice scooter with a good engine( I have an Activa 125 disc variant from 2016 so I can vouch for it) provided it's maintained well along with decent features. Also, are there any rattles from the Speedo console? Or any part of the body? 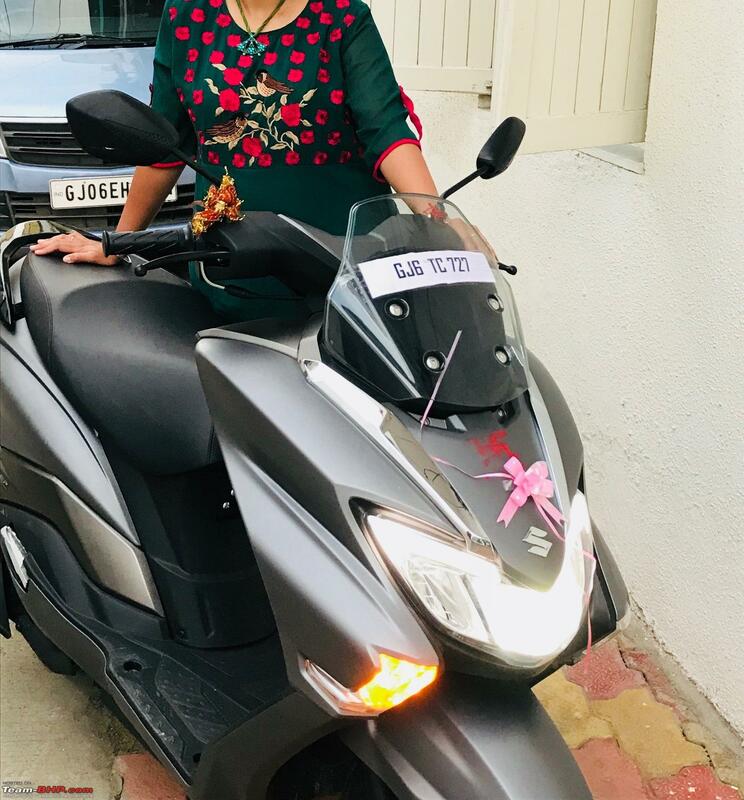 My Activa was fortunate enough to not have any rattles but most of my friends said they had a few since day one. Do keep this thread updated as I absolutely loved your writing style, wishing you tons and tons of happy miles with you beauty. Thank you for reading through and your kind words. Yes I did want to consider the Hondas, specially the Grazia. Those LED headlamps and front fascia looks gorgeous. However what stopped me was the fact that I wanted to switch between the Japs and see what Suzuki had to offer. The engine seemed like a reliable workhorse as it was doing business on the Access 125 and that has been selling well. A friend has also had absolutely hassle free ownership of the Access 125 since the past 2 years. 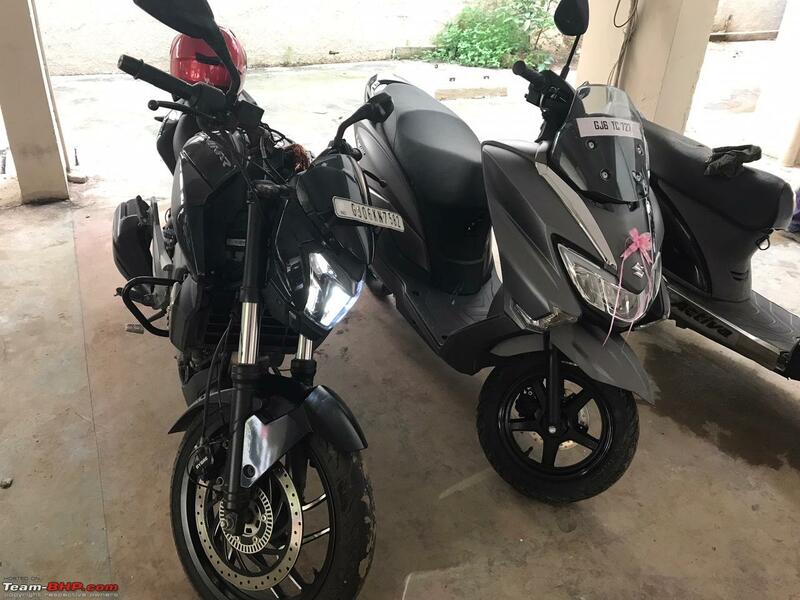 Also since my wife had owned 2 Activas till now, I wanted something with different genes I know that it doesnt seem like a great criteria but like I said, I dont know much about scooters and this decision was taken purely out of what felt and looked good. Then there was the delivery timeline where Suzuki assured me immediate delivery. I also took 2 friends along for the test rides and they concluded that the Suzuki feels better than the Honda. But again that was just pure bias, they both just loved putting their feet up on the extended footboards. There seem to be no rattles till now. I am wary of those panels and I have asked my wife to update me on the lightest of vibrations and rattles. 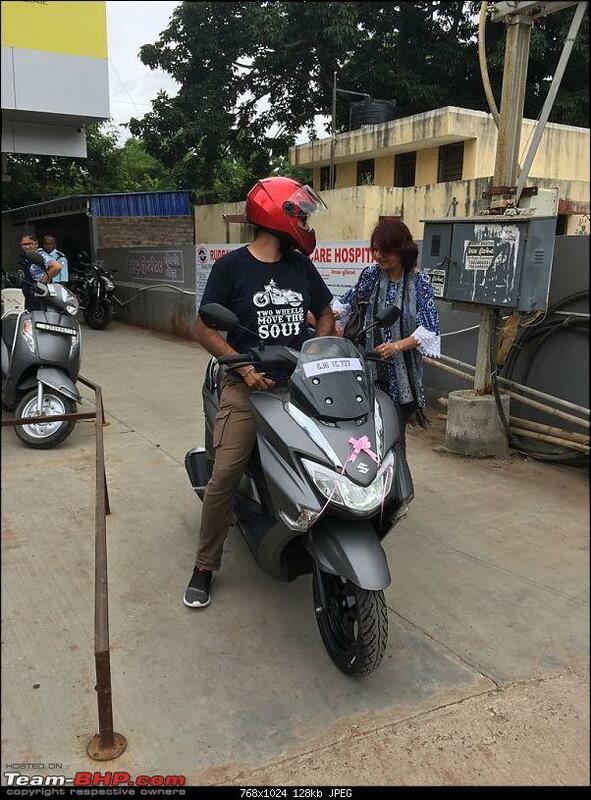 The scooter has crossed 160 kms as of this morning and there are 2 bars of fuel left. I will be able to update the mileage figures as soon as my wife tanks up. Please do highlight any other areas where I can contribute. A unique potential problem my wife noticed yesterday though was that the braking, even the rear one seems to have developed some sponginess in the morning. However it was perfect in the evening. I will be looking into this and testing this better in the coming days since the confidence under braking was what drew me to this scooter. 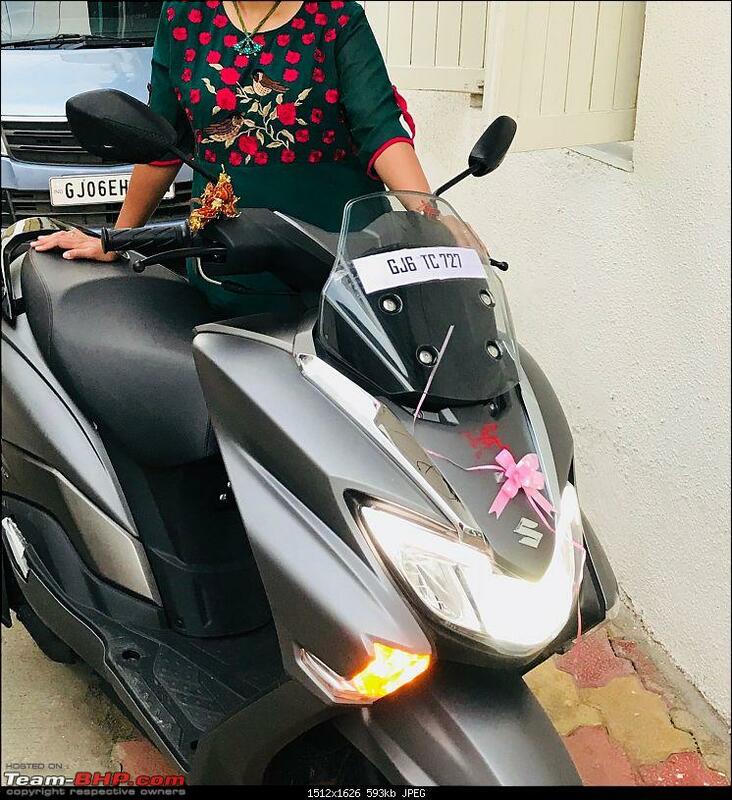 On an entirely separate note, I took the scooter to 70 kmph and wow no vibrations anywhere! I mean nothing from the floorboards, the mirrors didnt turn into tuning forks and the handlebar did not numb my fingers. The girth of the scooter also masks the speed well. So a note from me as well, please keep an eye on your speed when you ride this scooter. 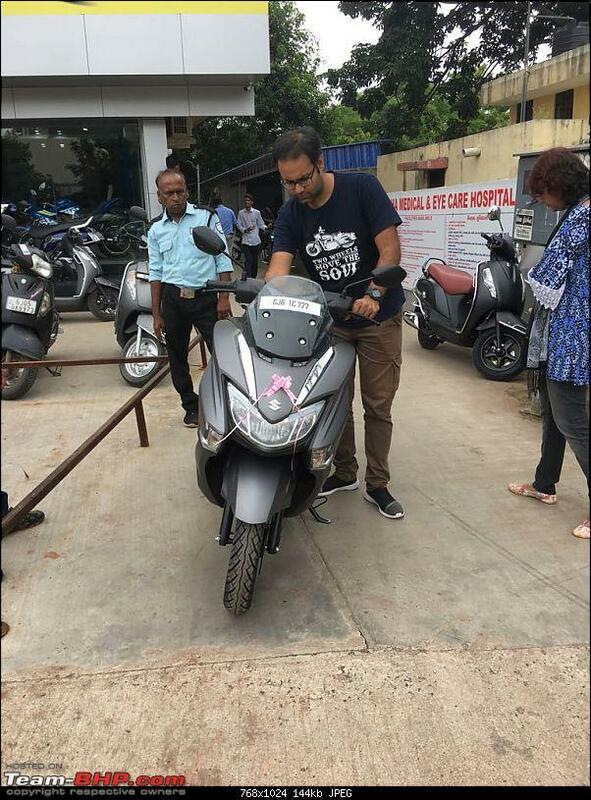 Congrats on the new scoot Vikram. I'm also in the process of getting a scoot for myself and the Mrs. I was going to ask how tall is your wife, but you've already covered that. My wife is vertically challenged and is all of 5'2 inches of awesomeness. So I'm skeptical if she's be able to even tip toe the Burgman or the Ntorq. However, will get some test rides to confirm. Wish you and your wife a lot of happy smiles on the Burgman. PS: Really hate the tiny rear wheel on the Burgman, wonder why Suzuki did not keep the rear wheel at 12'. Congrats on your new ride! Seems like a great choice and the bike looks butchy indeed and almost as big as the Dominar! The Access 125 had a silky smooth engine and a great performer for its class. Hope the Burgman continues the tradition. On a side note, can you post some pictures of the console? I was going to ask how tall is your wife, but you've already covered that. My wife is vertically challenged and is all of 5'2 inches of awesomeness. Thanks for your wishes Hiren. I think your wife will have to tip toe and the Burgman though not hefty will be a bit of a challenge due to the saddle height. Like you said, I think its best to take a test ride. The Ntorq saddle felt lower but I cant confirm this. I agree, that tyre is quite puny. I think Suzuki did this to make it peppier as well as more fuel efficient. Not a great excuse though! Last edited by Vikram8891 : 11th September 2018 at 14:49. Yes the looks are quite the talking point in our colony these days. Finally got a ride to take the limelight from the Dominar. I will definitely post pics of the console tonight. 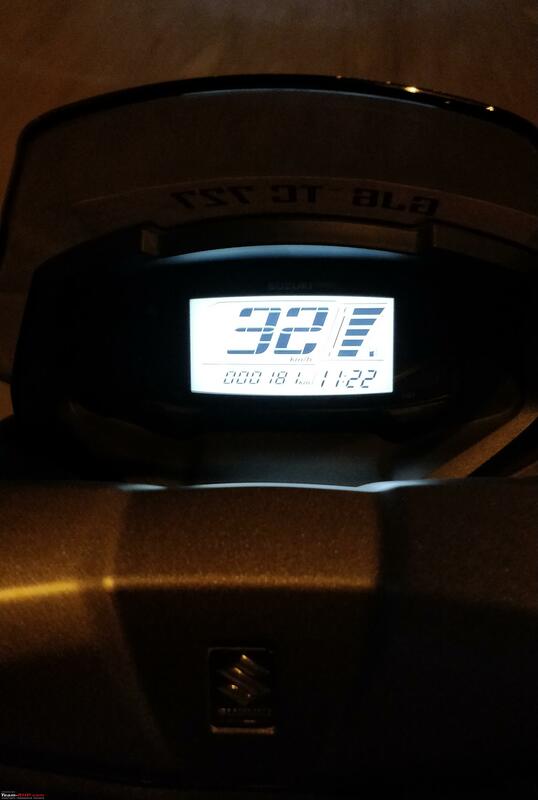 So finally got the mileage figures as well as the headlamps pics which give a better idea of the spread and intensity. So I used the tank full to tank full method for calculating the mileage and honestly I am a bit surprised by the figure. The Burgman came with 2 kms on the Odo and at the time of re filling the fuel last night to the brim it stood at 180 kms. The fuel it consumed was exactly 3.4 Litres which makes the mileage figure a rather astonishing 52 kmpl. 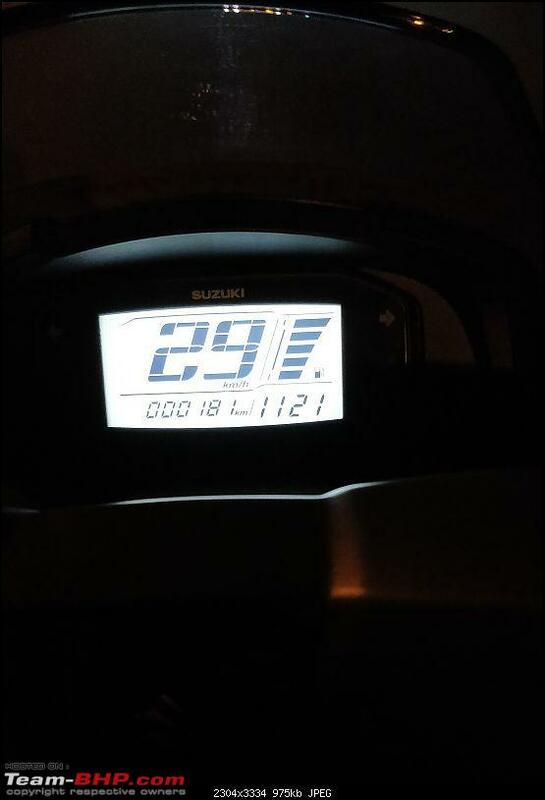 Throughout these 178 kms the Burgman has been ridden entirely in the city and a majority of it was under 60 kmph. It has been ridden by my wife in bumper to bumper traffic. However since I am from a 2 tier city our traffic is nowhere close to the jam packed peak hours of the metro cities. Still this is a very good mileage from something so punchy. Without further ado kindly find below the pics of the console. This was taken while riding. Also below are the headlight pics. 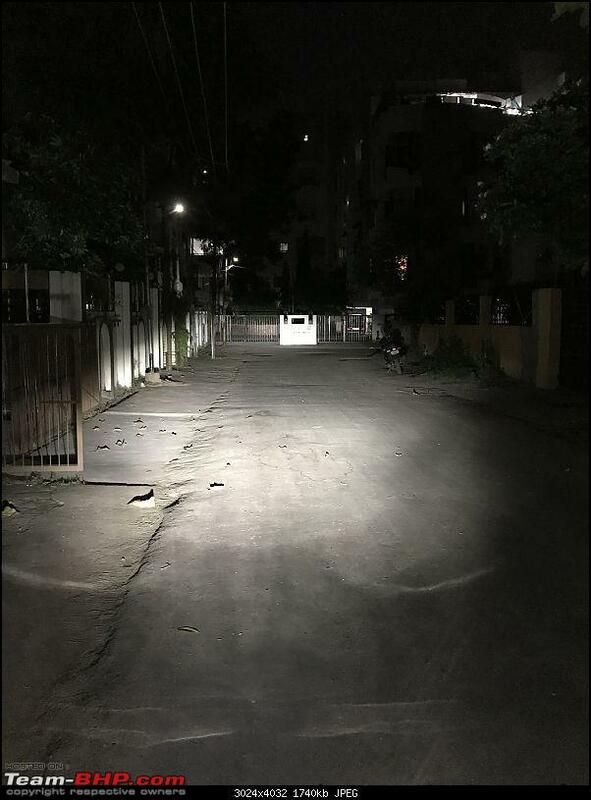 Please be advised that the wall you see at the end of the road is about 50-60 ft from the scooter. My apologies for not posting these earlier. All pics so far have been taken by our mobile phones and hence some may appear grainy or slightly tilted. Last edited by Vikram8891 : 12th September 2018 at 09:36.
yeah well good things (and a scratch proof paint job) don't last forever and this was bound to happen. Due to someone's carelessness in my wife's office parking lot the Burgman now has a scratch adoring its front right side apron just above the indicator assembly. By looking at the scratch one can tell that someone made it while removing their vehicle which was parked beside ours. Its thick at the front and peters off at the rear. My question from anyone who has owned a matt finish vehicle is - What are my options? would formula 1 or similar scratch removers work on Matt finishes? The scratch does not seem too deep so I am optimistic it can work but I have no experience with this. I did see YouTube videos which give the toothpaste and deodrant solution but I am not sure it applies to Matt finishes. Let me know what you all think my course of action should be. I don't want to end up making the paint worse. Vikram, Congrats & many thanks for the write-up. 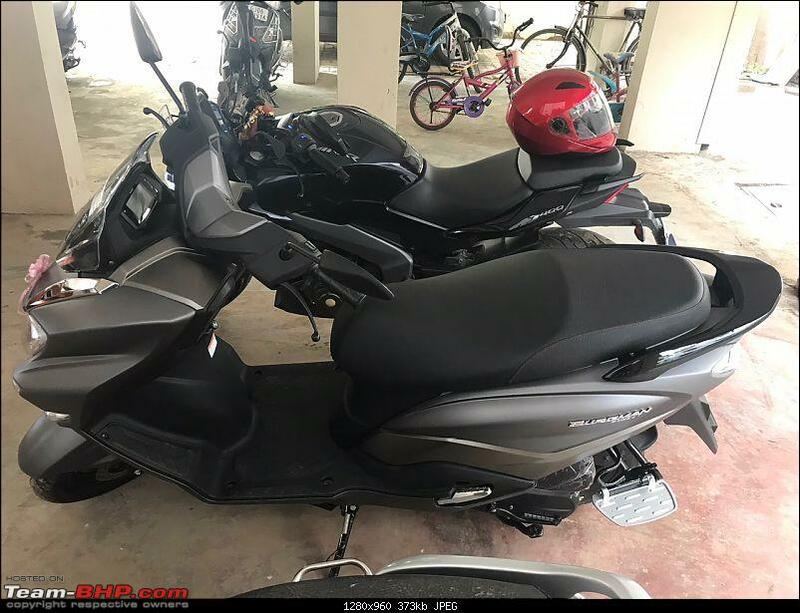 Does this scooter have a front storage box accessory option ? Can the rear wheel be replaced with a 12 inch similar to the front ? 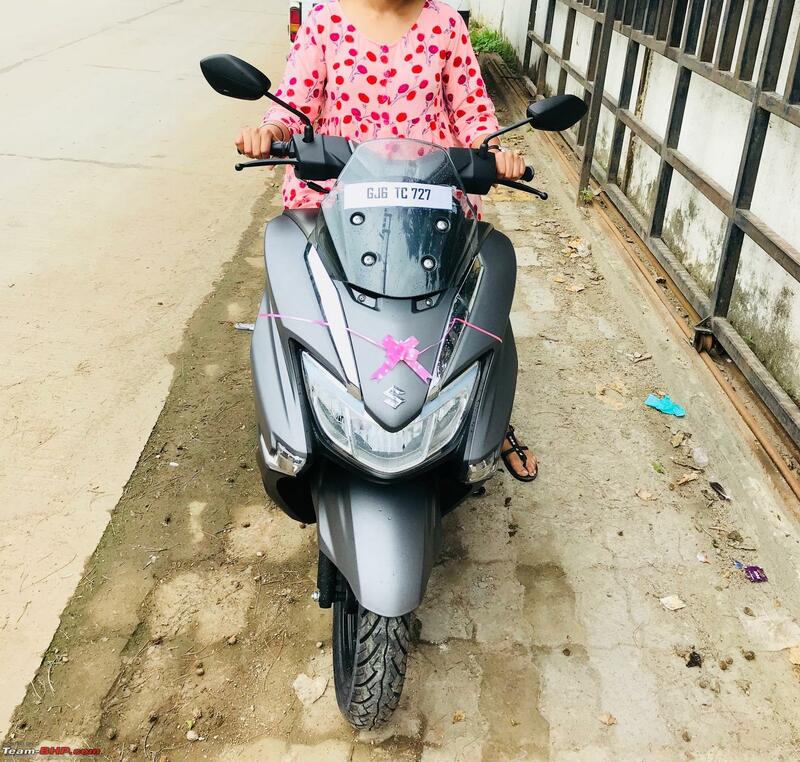 The seat seems to slope downwards at the front (and I know most scooter seats are like that) but is the downward slope more that that in the Activa ? The front storage box (which cannot be locked) comes with a charging outlet just like in cars. I have not yet tested this but I will do so over the weekend and update you. I did ask the showroom personnel about it and they said there is nothing additional I can purchase and opt for. I have no idea about the clearance the rear chasis/suspension will accord me so I can't say if it will allow me to change the tyre. I can ask the SVC guys once I take it in for service next month. The seat slope is not an issue for my wife. 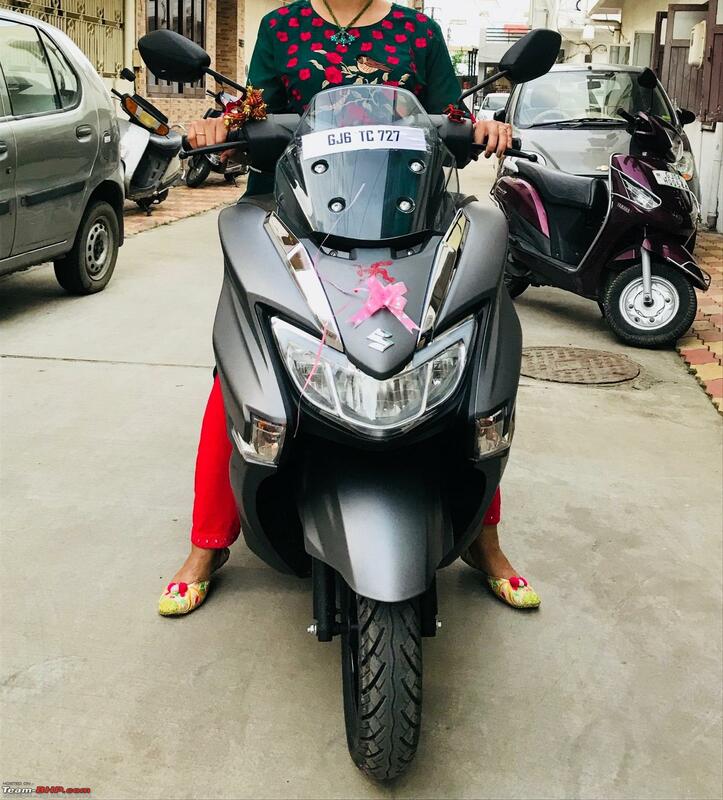 She says it feels the same as the Activa and does not really cause one to slip or keep moving ahead. So I think for someone accustomed to an Activa, this will not be an issue. All times are GMT +5.5. The time now is 02:04.